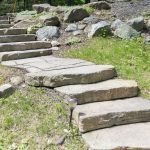 Landscape Upgrades You Can Do On A Budget | Masseo Landscape Inc.
Having a stellar landscape doesn’t always mean breaking the bank. 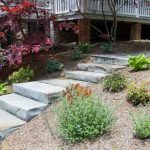 These are our favorite landscape projects that were finished under a tight budget. 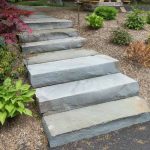 Products Used: Rosetta Grand Flagstone and Irregular steps. 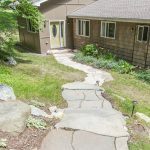 About: These homeowners needed a walkway and steps that would match the rustic landscape of their mountain home. Of course, we immediately thought of Rosetta. 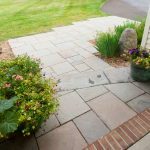 This pre-cast concrete product looks like natural flagstone, at about half the price. Products used: CAST Lighting Low-Voltage Bronze LED fixtures – “China Hat” Path Lights, down lights. 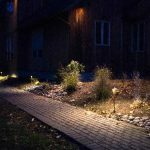 About: Landscape lighting is one of our favorite landscape add-ons, because you get a lot of value for the price. 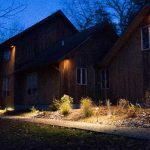 This lighting scheme lights up the driveway and front walkway at night, making getting in and out of the house safe and easy. It also gives the property great evening ambience. The best part? The remote control and light timer! 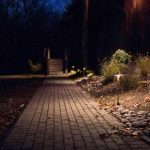 About: A contemporary walkway doesn’t need a huge landscape budget. 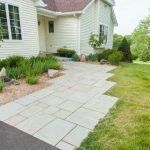 Rosetta Dimensional flagstone is a great substitute for traditional bluestone. These homeowners got that clean aesthetic at a lower price point by opting for pre-cast concrete over natural stone. This project also includes gutter extensions and those planting beds! About: Need the real thing? Keep your entryway layout simple can cut costs. 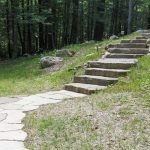 These natural blue stone steps and walkway were installed in under a week. 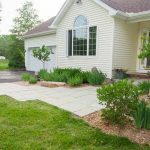 About: Using a stone substitute like pre-cast concrete can bring a large project into your budget. This retaining wall helped reinforce the eroding hillside around the driveway. Since the scale of the project was pretty big, we went for Outcropping. The final product has the rustic look of natural stone at half the cost. 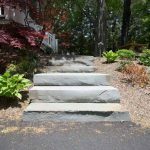 Our favorite add on is the Irregular Step staircase!